Here’s How To Arrange The Wedding Of The Year…. Sometime in the next short while there is going to be a very special wedding, it will most certainly be the wedding of the year, but do you know who’s wedding it is? Right here and now I will show you how to make it that very special wedding every bride and groom wants. The wedding that every guest will thank their lucky stars that they were on the guest list for. It is not the things you do the same as everyone else that makes your special day special, it’s what you do differently and better that makes it stand out. If you do the same as every other wedding then your wedding will turn into ‘just another wedding’ for a large number of your guests. Of course it will be a very special day for you and yours and for your close family and friends, but for many it could be ‘just another wedding’. Your guests will of course be happy to be there, but unless you make it really special for them, it could become same old, same old, same old, you know what I mean. Maybe some of these ideas will not appeal to you, if so don’t worry, it is your special day and nothing will be forced upon you, you simply choose what you would like. View our ideas like an imaginary buffet table of suggestions. I will put on the buffet table some ideas that Clive has performed for other brides and grooms. Every care is taken to make sure only the very best are offered to you. You pick off that buffet table ONLY the ideas that you like – just like any other buffet table, you leave behind anything that does not appeal to you. Your very special day, is complemented by having an adult and (if necessary) children’s entertainer to make the day a highly memorable one for everyone. Clive is a very experienced performer at weddings, with over 1,100 weddings under his belt. Reception is a time when three (or more) groups of people (Brides family, Grooms family and the couples friends and colleagues) who, by and large, don’t know each other, are asked to mix. 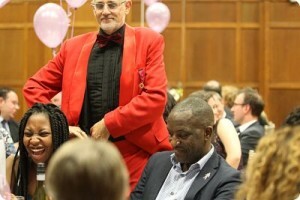 Clive entertains your guests with his reception magic including Cards, Coins and other fun things. 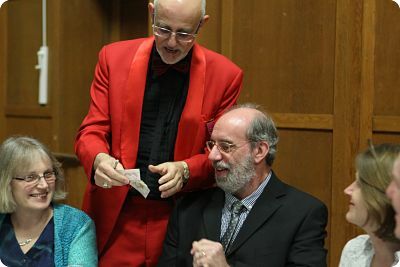 Clive demonstrates how card cheats work, how money can be made to do some impossible things and the whole of his performance is punctuated with gags, one liners, puns and bits of fun that make guests want him to stay for longer or return quickly. Stunning magic happens right in the hands of your guests. It is so strong it draws audible responses from your guests, you hear laughter, shrieks of amazement and rounds of applause. These audible responses turns heads. People are thinking “what’s going on over there?” Clive is on the look out for these people and invites them to join the group he is working for, shows them a miracle and leaves them talking about what they have just seen. How did he do the one with the…….? This is a great complement to any other activities that may have going on. 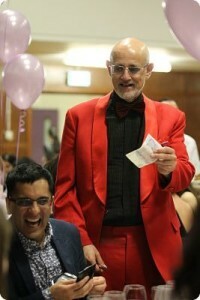 During the wedding meal, Clive covers all the tables with his very special brand of humour and magic. Again the emphasis is on entertainment, but the magic is of course very strong. He has a number of magical master routines each lasting from 2 to 10 minutes. You see money change in value, holes in money or cards disappear before your very eyes and coins penetrate solid matter and much, much more. All this happens right under the noses of you and your guests. All done with sublime slight of hand – will you see how he does it? Clive ensures that enjoying tables don’t see the same act. Clive is a Member of the exclusive Magic Circle and is six times Surrey Close Up magic champion. With his years of experience, he knows just where and when to be working for you and when not. He is also able to make suggestions both before the day and on the day itself that make your life easier, the party more fun, memorable and perhaps even save you some money. The younger guests are not left out or forgotten as Clive is an accomplished children’s entertainer and balloon modeller and if you have a small number of children, Clive is happy to make a special model for each of the children. 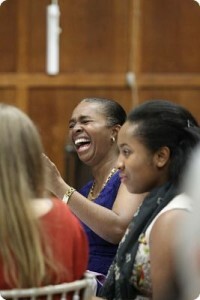 Children are an important part of most weddings and yet are seldom properly looked after. If you have a larger number of youngsters, it is unrealistic to expect them to sit for two hours during a meal and then for a further 20 to 30 minutes during speeches. Clive is able to take them to another room, after they have finished their meal, and entertain them royally. A special wedding day party for the children includes a warm up to let everyone know he is great fun to be with, but also it eases away any little bits of shyness and gets the more boisterous youngsters back on the straight and narrow. A magic show designed for a big span of age group, including lots of funny bits, audience participation, a live bunny rabbit, and a wealth of magic that will draw gasps of amazement from the children. His very funny balloon modelling routine is featured, which will have the children howling with laughter to the point that their tummies hurt. Finally, if required, party games including prizes and balloon models for all. The children are occupied for as long as you wish, but normally until the end of the speeches. After dinner, offers an opportunity to use Clive to further enhance your party. He can perform his Cabaret show for any length from 10 to 50 minutes. The show includes up to seven routines that are packed with fun, laughter audience participation and of course some very strong magic. Shall we pass some liquid right through the middle of the bride’s Mum, or tear up the Best Man’s jacket (and then restore it of course) or saw a special auntie or friend in half? all are possible and much more besides, perhaps Clive can predict the winning lottery ticket numbers and really make somebody’s day! 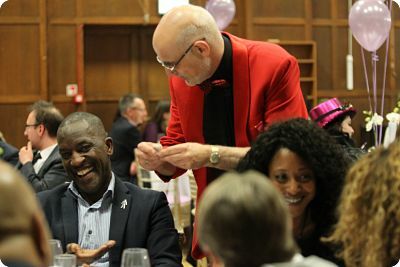 Clive can entertain people who choose not to dance, with his Close Up table magic. Usually a large minority of guests choose not to dance at some point during the evening. Clive has 538 Close Up magical effects in his repertoire and chooses the magic most suitable for your non-dancing guests. This is another chance for you and them to watch some mind boggling magic. Clive considers this part of the evening to be primarily dancing time and will not allow his work to interfere with the ball. It, however, makes your non-dancing guests feel as if something has been put on for them too, and makes them feel special. Clive also has a very special magical effect for the happy couple, which takes only 2 to 3 minutes but always makes the audience say aah. A truly remarkable effect with cards, designed for the happy couple, that imprints itself on the minds of all that see it, an effect that must not be missed, but of course I am not going to spoil the surprise by telling you too much about it here. The wedding game is packed with loads of fun. The bride and groom are invited into the middle of a circle formed by their guests. You both sit on a chair back to back and exchange your right shoes. Each partner is now holding one of their own shoes and one of their partners. Clive will ask some questions, for example. Who spends most time on the telephone? Or, Who is first to make up after a row? And many other such questions. Each of the happy couple holds up a shoe, either their own or their partner’s to indicate their answer to each question. When you agree (and you usually will) you receive a big cheer and a loud round of applause from your guests, however, if you should ever disagree the panel of three mutual friends will make up their minds and the losing star (either the Bride or the Groom) has to do a small forfeit. This game builds and builds and so does the fun, so don’t dismiss it too quickly; it’s one of those things that makes your wedding stick out in peoples minds. If for any reason whatsoever, (or even no reason at all) you are not absolutely ecstatically pleased with everything we do for you, if you do not agree that Clive is the most entertaining magician you have ever seen, that the feedback from all your guests is numerous, enthusiastic and very positive, that his children’s show (if that is part of his performance for you) has them sitting boggle eyed and laughing all the way through. 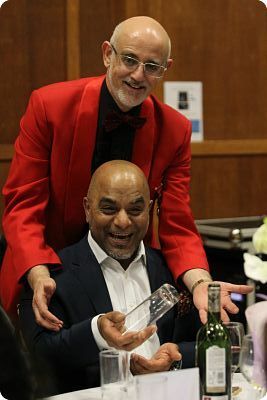 That his Close Up “Mix ‘N Mingle” magic has all your guests engaged and talking, that his table magic is fun and of a very high standard just as you would expect from a magician who is six times Surrey Close-Up magic champion. That our staff are friendly, approachable and helpful, and everything goes to your complete satisfaction, then simply tell Clive on the day and he will cancel your bill and you will not owe us a penny. Simply put you must be 100% off the scale happy with EVERYTHING Clive does for you or he will tear up the contract and you will owe us nothing. There will be no questions or hard feelings either. This is your guarantee that everything will go just as you want it to and you have a truly fantastic time on your special wedding party day. I am betting though, that you will be more than happy with all that he does for you and you will even pass on Clive’s name to friends and colleagues planning their parties, but that is entirely up to you. If you have any questions you can either call Freephone 0800-0188118 (best from a land line) or 01737-350586 (best from a mobile) or if your prefer you can email Clive@stunningweddingmagic.co.uk for more contact options. P.S. As a special thank you for reading this letter, I would like to gift you completely free of charge and without obligation a copy of the “Wedding Entertainment Guide” The guide is stuffed full of everything you need to know about entertainment at weddings. It has loads of tips on booking music acts, questions to ask speciality acts, the pros and cons of every aspect of wedding entertainment. It has many money saving tips, which could help save you a small fortune, and it has so many ideas that it makes you want to have two days for your wedding to fit everything in. (well perhaps that’s overstating it a bit). To get your copy simply click the link and fill a little form and the Wedding Entertainment Guide will be yours in a flash. P.P.S. As a thank you for reading this page to the end, here is an interesting fact you might not know about weddings and marriage….